Travelin’ Man is a self-produced set of soul-blues that demonstrates his mastery of the genre as he wraps his smooth tenor around a diverse set of covers and originals. Johnson cites Tyrone Davis, Little Milton, and Johnny Taylor as influences and pays homage to them with straightforward versions of “Sugar Daddy”, “If Walls Could Talk” and “Last Two Dollars” respectively. The title track penned by Maurice John Vaughn, is a brassy midtempo shuffle with slithery slide guitar. It’s a perfect vehicle for Johnson, whose motto is “Have drum will travel.” The drinking lament “Me and Jack (Daniels)” feature Sonny Rhodes on lap steel. Both tunes would be right at home on an Elvin Bishop album, as would the churning swamp rock of Tony Joe White’s “Steamy Windows.” Another Johnson original “Apple Tree,” evokes the Ecko Records sound with its sparse instrumentation of keyboards, guitar, and programmed drums; Gib Monks’ savory sax licks break up the synthesized monotony. The treacly torch song “Always On My Mind” showcases Johnson’s versatility, but it sounds out of place and disrupts the album’s overall tone. Johnson is a restrained vocalist who uses subtlety in lieu of emotional overstatement or sexual braggodacio. Despite a few questionable decisions, the unpretentious Travelin’ Man succeeds thanks to quality musicianship, sound production, and warm, supple vocals. Originally from Bryan, Texas, where he was born in 1948 and came up gigging with pianist Nat Dove, Donald Ray Johnson took up music in earnest playing drums for the likes of Joe Houston and Lowell Fulson after relocating to the West Coast when he got out of the Navy following a tour of duty in Viet Nam. He’s since migrated northward to Calgary, Alberta, where he recorded a couple of CDs in the 1990s as Don Johnson and another in 2002 under his full name, while also serving as drummer in the Phillip Walker Band. Johnson has proven himself to be an able tunesmith, but there are only three originals on offer here, with the title track and Apple Tree featuring Maurice John Vaughn on guitar and Me & Jack (Daniels) boasting a guest spot by Sonny Rhodes’ lap steel. The covers are a varied and well-chosen lot, though, ranging from Elmore James and former boss Fulson through Little Milton, Johnnie Taylor, Tyrone Davis, Bill Withers, Willie Nelson, and Tony Joe White. The program ends with the a cappella You Reign King Jesus by JohMax, a vocal trio featuring the fiery lead of Johnson’s daughter Panzie with his other children Tonya and Johnathan in support. Johnson again proves himself to be a strong singer, and with its solid band work and production values, this set is a clear cut above the general run of vanity label CDs. 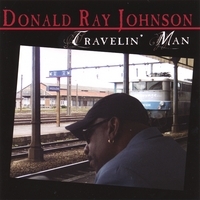 “Travelin’ Man” by Donald Ray Johnson is an all-around great blues album. Immediately grabbing the attention of listeners is the eclectic instrumentation – electric guitars, organs, and brass instruments mix to produce a uniquely compelling sound. Donald Ray’s soulful tenor timbre is full of passion and control. Furthermore, the songwriting on this CD is crafted with highly relatable and poetic lyrics.The tear-inducing love ballad “Always On My Mind” ventures away from this CD’s general upbeat pace, and allows Johnson to show off a softer, more personal side. “Last Two Dollars” shines with a hint of R&B flare, and draws listeners in with a powerful saxophone intro. Every aspect of “Travelin’ Man” exemplifies professionalism. This is one CD that will not go unnoticed. THIS ALBUM IS ABSOLUTELY TERRIFIC! RadioIndy is proud to present Donald Ray Johnson a GrIndie Award for their CD "Travelin' Man." A GrIndie Award is RadioIndy's stamp of approval that this CD is an excellent quality CD. Please join us in congratulating this artist on this accomplishment.